Austerity entered the Italian political agenda with the economic downturn of 2010. Supranational pressures, coupled with domestic changes in the government coalition, paved the way to an intense programme of rationalization through “across-the-board” measures in several domains which fell under the responsibility of local governments (water service, waste, public transport and social welfare). This triggered a shift from a “doing more with less” to a “doing less with less” strategy, implicitly impacting on the autonomy of local governments. The chapter aims at assessing whether, how and to what extent austerity implied a policy transfer or was a window of opportunity for domestic games. 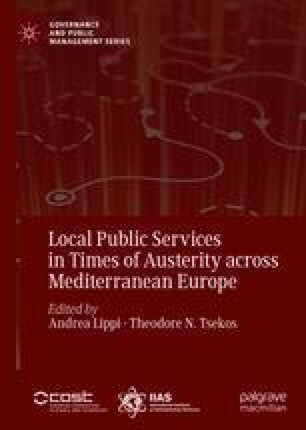 The contribution traces the process which links the austerity measures in the national agenda to their local impacts. Issue framing and the choices of policy instruments at the central level are analysed first. Secondly, the chapter focuses on the impact of strategy and measures that directly or indirectly affected the management and delivery of local public services. Finally, the contribution provides an overall discussion of the outputs and outcomes of such a new approach at the financial, social and political level.